Looking for a good fan cooler to keep your CPU cool? We’re breaking down today’s top CPU fan cooling solutions by budget. We’ll give you a look at our current favorites along with a guide on how to keep your PC ice cold. This quick review breaks down what you need to know about thermal performance, noise, and design. Below, we’ve also included a learning guide for everything you need to know about keeping your PC cool. Not only is the Be Quiet! Dark Pro 3 a great looking CPU cooler, it gives you a high amount of performance for the amount you spend on it. In terms of performance, we’d put it on par or just one degree below the Noctua NH-D15. Speaking of the NH-D15, the Be Quiet is a bit smaller but uses a faster fan to compensate. For noise, the Be Quiet! Dark Pro 3 does give the lowest cooling-to-noise ratio around even beating out the Noctua NH-D15. Science Studio (see their video below), disagree with how it sounds overall. However, in terms of measuring overall noise level, the Dark Pro 3 is at the top of our list. This is backed up by testing done by both Anandtech and Tom’s Hardware. Overall, it’s hard to go wrong with the Dark Pro 3. The price is very reasonable at $80 to $90. The performance is top tier and the noise levels are low compared to other options in its category. We think it looks pretty fantastic too. It’s also compatible with both Intel and AMD builds. At lower loads, the Noctua NH-D15 does have superior thermal performance when compared to the Be Quiet! Dark Pro 3. In fact, we’d put it at the best available for that mark. 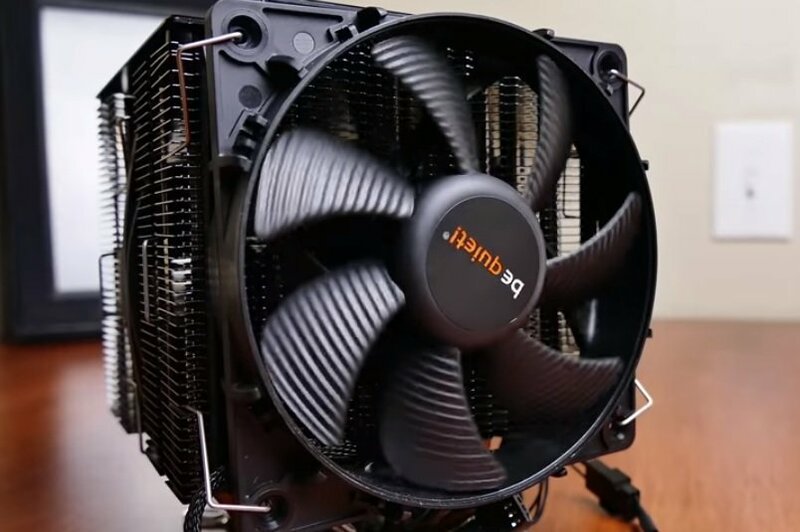 As I mentioned above, the NH-D15 isn’t the quietest fan CPU cooler available. However, it does have a low overall noise level at just 38.6 dBA from around 1 meter away. In comparison, the Dark Pro 3 has 36.4 dBA. For reference, most feel that an increase of 3 dBA is barely perceptible to the human ear. If you’re still trying to decide, 35-38 dBA is considered a whisper or slight humming while 38-40 is a relatively comfortable hum. 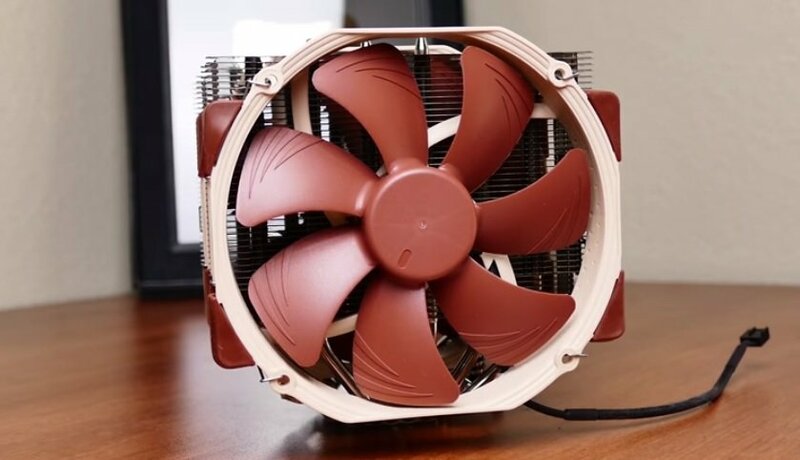 Noctua’s tan colors are synonymous with quality but don’t fit the color of every build. So, if that’s what’s holding you back, try their new Chromax Fans and kits for the Noctua NH-D15. These look fantastic and allow you to color coordinate. The NH-15 has a 6 heatpipe dual radiator design that gives performance enthusiasts and overclockers an excellent cooling option. The D15 has better thermal performance, cools more quietly, and is simpler to install. The NH-D14 is still often a value option. Overall, the Noctua NH-D15 is similar in price to the Dark Pro 3, offers better performance, low noise overall, and a great design when incorporated with Noctua’s Chromax kits. If you’re looking for something a bit less expensive but still very good, the Arctic Freezer i32 is a good option at around $65. With 4 copper heatpipes it’s smaller than the fan CPU coolers above but still provides a good level of performance. The i32 is designed as a passive cooler and thus only spins when it is under some load. So, while under this low load you can’t hear a thing. As I write quite a bit, I personally found this to be a great option. Under load, the fan is still very quiet. At just 26.3 dBA at 1m under max load and 24.7 dBA under an average load, you can hardly hear it. 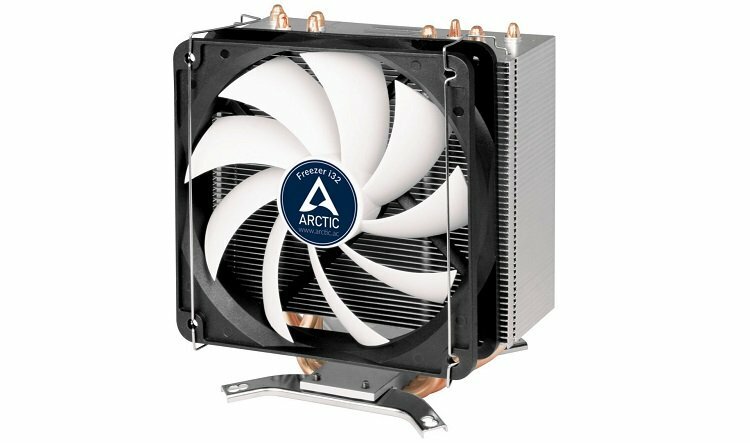 The Arctic Freezer i32 isn’t meant to be the best performing CPU cooler on the market. However, it does a good job at getting you an overclock, stays quiet, and has a slimmer profile than the large CPU coolers at this price point. And it’s very affordable at just $65. It’s definitely recommended for those of you looking for a moderate overclock who don’t want to use a large case. It isn’t, however, a slim CPU cooler. We’ll give you more of those options below. Want similar performance at almost half the price? Here are a few fan CPU coolers Under $50 that allow for a solid overclock, have little noise, and a stellar price to performance ratio. If you’re looking for a solid overclock at a budget price, the Cryorig H5 Ultimate gets you close to CPU coolers twice its price. It’s a bit louder than the Be Quiet Dark Pro 3 above and even the Noctua NH-D15. However, we feel the performance makes up for it. Performance, in terms of pure thermal performance, is right around that of the Dark Pro 3 and slightly under the NH-D15. Overall, it’s incredible at this price point. While we didn’t recommend Cryorig’s big R1 at the price point above, the Cryorig H5 gets it done at a good price to performance ratio. At $50 it’s more expensive than the well-known Hyper 212 Evo; however, it definitely wins hands down in the thermal performance war. If you’re worried about ram clearance issues, we recommend the Cryorig Universal rather than the Ultimate here. Keep in mind that for around $40 less than the models above, this option gives you similar performance, with a bit more noise, and almost as good of a design. If none of that bothers you, this one ultimately gets our top recommendation. This would be a fantastic option in use with our $500 Motherboard, CPU, and GPU combo. 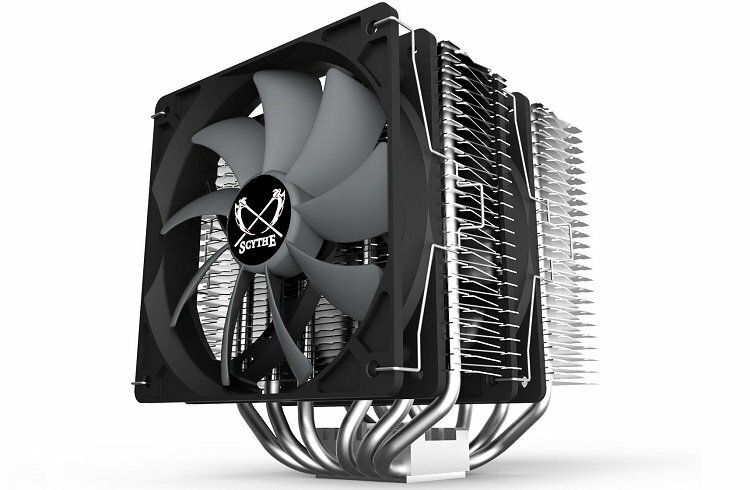 Another great looking fan cooler with good performance for under $50 is the Scythe Fuma Rev. B. Compared to the NH-D15 the Scythe Fuma Rev. B it falls in at 2 degrees warmer under full load and several degrees warmer at 50%. Compared to the absolute best liquid CPU cooler you can buy, it’s only behind by around 6 degrees. It does all of this while keeping up with many 240mm AIOs. Going from PWM to DC control, you can get very similar performance to the NH-D15. In terms of noise levels for larger CPU coolers, the Scythe Fuma comes in as one of the lowest options available. It’s about a dB lower than the NH-D15 in most scenarios and only gives off slightly more noise than Dark Pro 3. Most likely this isn’t something you’d notice once both were installed in a case. Installation for the Scythe Fuma would be my only gripe. The center fan clip wires typically snag the end fan during the install. However, once it’s done you’ve got something with incredible value. The Fuma keeps up with many CPU coolers twice its price, makes little noise, and has excellent cooling overall. Want a decent overclock in a small form factor build? At the $50 price point, we like the Shadow Rock LP from Be Quiet. When you’re looking at a small form factor cooler, you can’t expect it to be on par with the big boys. With an overclocked load, the Shadow Rock LP is about 12 degrees warmer than the Noctua NH-D15. Yet, you’re getting something here that is nearly 20 degrees cooler under overclock load than the stock option provided by Intel. At lower loads, the Shadow Rock LP is similar to the NH-D15. At higher, it’s about 3 dB lower. So, it’s very quiet, efficient and nearly silent once installed into your case. Overall, this is the low profile option we’d choose if you’re using a small form factor. It gives you decent performance and doesn’t really get in the way like larger options do. Looking for value? You might be surprised what you can get for under $25. Slim form factor and full-sized CPU coolers are available here with decent thermal performance. The Gammaxx 400 is available in black with Blue LEDs, red, and white colors. The Deepcool Gammaxx 400 fan CPU cooler represents a slim offering at a low price point. So, how does it stack up against the competition? The performance for the Gammaxx 400 is what sets it apart. At just $25 its performance is better than the Shadow Rock Slim and the Noctua NH-12S while being half of their price. Performance comes at a price for the Gammaxx 400. It’s about 4dB louder on average when compared to the Shadow Rock Slim and the Noctua NH-12S. At 50% its just 2dB louder. The Deepcool Gammaxx is available at around $25 due to its lack of a window dressing on the finished top plate and other design factors. Still, it doesn’t look horrible as you can see above. Some of you may even be putting something like this into an HTPC case. For that type of option, we couldn’t recommend it more. For budget builders, save a buck here and go with something that’s a little bit louder and offers the same performance. 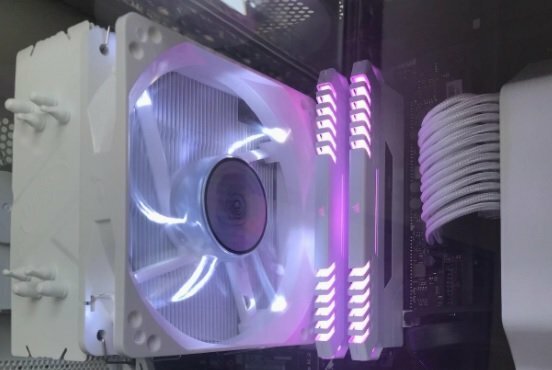 The Cooler Master Hyper 212 Evo is probably the best-known cheap CPU fan cooler on the market. At a price of $20 to $30, it offers decent thermal performance. I’d put the Hyper 212 Evo at around 6 degrees warmer than the NH-D14 at full load. One of the main reasons that people like the Hyper 212 Evo is that it can take something like the Ryzen 7 1700 and overclock it to 4GHz (in most cases). While it’s a bit louder and doesn’t do as good of a job as some of the options above, it does do the job. And it does it a price point that’s one third the cost. We’re looking for a reason to replace this old cooler here but we simply can’t. 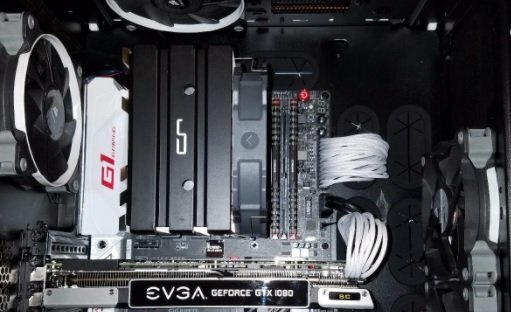 It’s a solid solution for budget builds or builders that want a slight overclock. 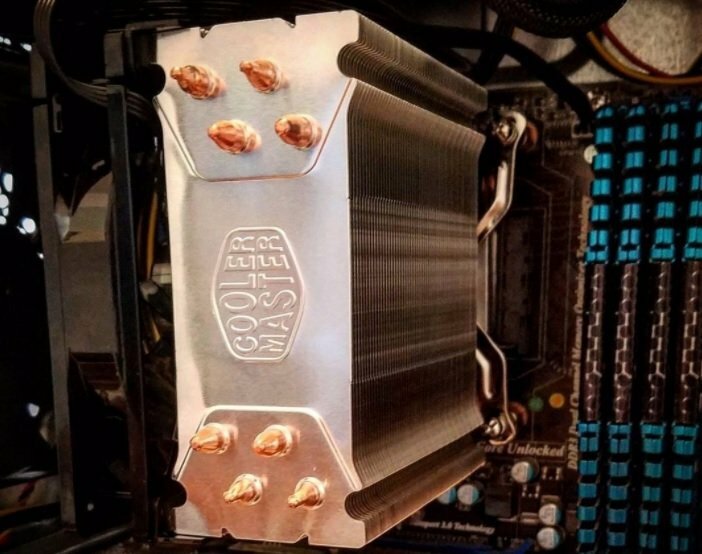 So, Why Is It Important To Keep Your PC Cool? Those who say your PC has an optimum operating temperature may not completely understand our point here. Yes, lower is better as long as you don’t get below ambient temperature as water droplets can form on your expensive components. This is a lot worse than components that are simply hot. Individually components often list their maximum temperature range while omitting a minimum temperature. Throttling occurs when you go over these temperatures. So, if you want your components to run even at their listed speeds, you’ll need to fall below that. Keeping your processor cool with a CPU cooler isn’t the only step to keeping a cool system. If the rest of your system is hot, you can still run into issues. So, how do your keep your PC cool? The more power that your PSU draws, the more heat that’s dissipated from the power supply’s internal energy loss. The more efficient your power supply is, the less heat it will dissipate. Using less energy in the first place is the best way to avoid this. Over time, components have already become considerably more efficient. However, making sure that the components you purchase are the more efficient option available, will help. Fan filters only go so far. Use canned air, an air compressor, or a powerful vacuum to keep your system clean. Dust restricts airflow and prevents fans from spinning as efficiently as they could otherwise. Your PC needs a prime piece of real estate. Make sure it’s in a location that’s properly ventilated. Avoided putting your computer up against the wall or in a corner. Cases with plenty of ventilation and mesh offer better ways for heat to escape. Liquid cooling, fans, reapplying thermal paste, and even your room’s AC can help to keep your PC cool. There you have it. Several fantastic CPU fan coolers that give you a better price to performance ratio than their liquid CPU counterparts. Keep in mind your case and CPU clearance. On the high-end, we like the Dark Pro 3 for its style and performance. Mid-Range its hard to beat the Scythe Fuma and Cryorig H5 Ultimate. For under $25, Deepcool has a true winner in the Gammaxx 400. Hopefully, this review has helped you decide which fan cooler you should go with. Have a question? I regularly respond to comments.